The ancient art of toothbrush twirling! Most people from the age of 3-4yrs and upwards can achieve a toothbrush twirl within a few minutes of practice! To begin with, you need a toothbrush (one with an angled head is the best, but not essential)! You may also decide to use a stick instead of your finger as this is easier. I use a devilstick handstick which is 2mm silicon and brightly coloured. You can sometimes get lucky and find 12 toothbrushes around £1 if you trawl round the 99p and £1 shops that are in most towns and cities! A few packs of these, and you have enough equipment for a workshop! Other optional items are a cup of cold water, and a towel. This is because if you are using your finger, then by putting your finger in water (or dunking the toothbrush head in a little water) adds to the friction and the toothbrush is less likely to fall off! The towel is to stop the floor getting too wet, and allow participants to dry their hands afterwards! Balance the toothbrush on a stick (devilstick handstick is ideal for this). If you don’t have a stick available and would prefer to use your index finger (the finger beside the thumb) then this is ok. The instructions are the same! The idea is to move your stick or finger in little circles so that the toothbrush rotates under the stick and then over the top of the stick. If you find that the toothbrush just flies away as soon as you start, then it is possible that you are trying to spin the toothbrush in the opposite direction! Remember which direction isn’t working, put the toothbrush back on the same side of the stick again and spin in the opposite direction! If the toothbrush appears to fly off the top of the stick after a few twirls then raise your stick vertically. If the toothbrush seems to wind its way down the stick towards your hand, then lower your handstick. 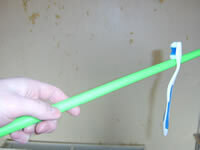 1)Squash the heads of 2 toothbrushes together to form a stabiliser and fit it onto the stick. As long as the person doesn’t try to spin the toothbrushes too fast, they can’t fall off the stick now! 2)Hold onto the stick (either by standing behind the volunteer, or by holding the top end of the stick) and while they are holding on to the stick also, make the circular motion and get the toothbrush started. Tell them that you will be letting go of the stick and that they need to keep it going, then count down from 5, let go and they should be able to keep the toothbrush spinning round the stick! Use Your Weaker Hand Try spinning the toothbrush using your index finger or a stick from your weaker hand. 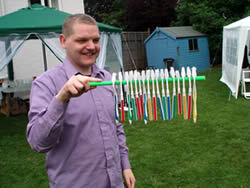 More Than one Toothbrush Try spinning multiple toothbrushes (you need a stick for this!) Spread the toothbrushes out evenly but still nearer the top of the stick than your hand. I tend to spin 4-5 toothbrushes, and they do eventually fall off one by one, but just keep spinning even if some do fall off as it still looks impressive! Behind the Back Just pretend to be spinning it, and look as if you are concentrating very hard! Pass from Hand to Hand Try spinning a toothbrush on a stick, and then passing that stick to your other hand or to a partner while keeping the rhythm going so that the toothbrush doesn’t fall off! Catching the Toothbrushes You may be able to do a fantastic 5 toothbrush spinning routine, but catching them at the end when you stop spinning is quite tricky! It just comes down to practice though! Toothbrush into Pocket Try to stop spinning the toothbrush so that it falls into your trouser or jacket pocket (or perhaps a hat on the ground). Spin from Stick in Mouth Spin a toothbrush (or more than one) from a stick which is held in your mouth. 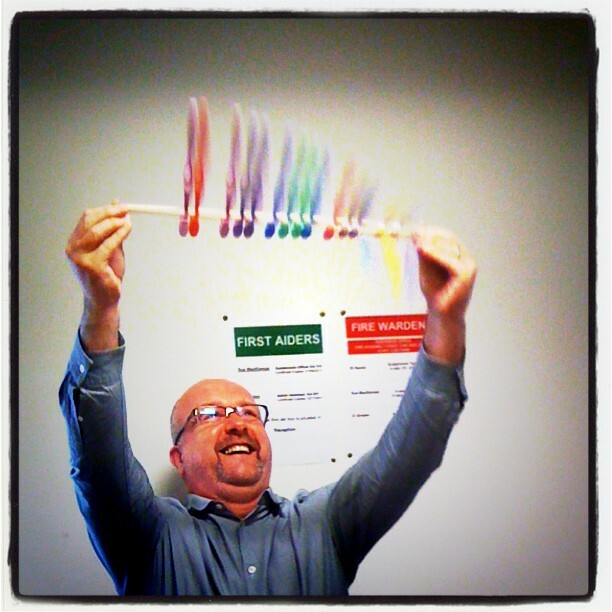 Here is a picture of my friend Craig attempting to spin loads of toothbrushes. I won’t tell you if he succeeded or not, but how many do you think that you can spin???!!! You can use the handle of the toothbrush as the pointy end of a plate spinning stick, so you can move on from performing toothbrush twirling, seamlessly into a plate spinning routine! I hope this helps and provides some fun for you and your friends. Let me know how you get on! If you have any other silly extras that could be added to workshops, then please let me know as I would love to find some more fun things to add!